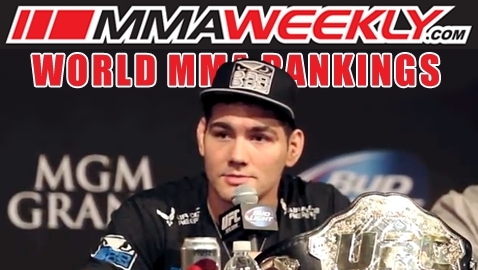 The updated MMAWeekly.com World MMA Rankings were released on Tuesday, July 9. This system ranks the Top 10 MMA fighters from across the world in each of the seven most widely accepted men’s weight classes and the Top 10 pound-for-pound women fighters. Taken into consideration are a fighter’s performance in addition to win-loss record, head-to-head and common opponents, difficulty of opponents, and numerous other factors in what is the most comprehensive rankings system in the sport. Fighters who are currently serving drug-related suspensions are not eligible for Top 10 consideration until they have fought one time after the completion of their suspension. Fighters must also have competed within the past 12 months in order to be eligible for Top 10 consideration unless they have a bout scheduled within a reasonable time frame. Notes: Dominick Cruz is ineligible for consideration because he hasn’t fought in more than a year. Pat Healy is ineligible for consideration because he is currently serving a drug-related suspension.